Oh my goodness, this was yummy! The recipe is Pioneer Woman’s, but I changed it a bit to suit our tastes. Her recipe calls for mushrooms, which we don’t like, so I eliminated them. I didn’t have any wine, so I only used chicken broth. And I was too cheap to buy the whipping cream when I already had half & half, so the calories were reduced a bit. I also didn’t have any peas, so I left them out. Bottom line is, substitute as needed! Start the pasta cooking. In a large skillet melt the 2 Tbs. butter and 2 Tbs. olive oil together and cook the onion and garlic until translucent. Add the brocoli and carrots to the pan and cook a few minutes. You want them to still be a bit crisp. Remove from the pan and add more butter as needed and the red peppers. Cook until tender crisp and remove from the pan and saute the rest of the veggies in batches. When all the veggies are cooked and removed from the pan, pour in about a cup of chicken broth and scrape up the brown yummies from the bottom of the pan. Cooking over medium heat, add another 1/2 cup chicken broth, 2 cups half & half, and the cheese. (PW calls for 1/2 cup cheese, but I used the whole container) Add salt and pepper to taste, as well as the chopped basil leaves. Drain the pasta and put it back in the cooking pot. Add the veggies and the sauce and stir to combine. 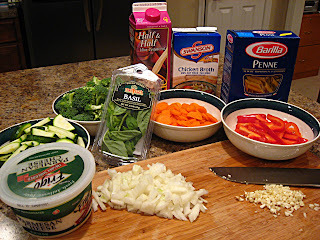 If you need to thin the sauce a bit, add more chicken broth and/or half & half. That looks really yummy. I will put this on my list of meals too. Thanks for the recipes. I’ll let you know how it turned out when I do it. Thanks for letting me come visit. Mmm…that really does look good. I’m sure my kids would just eat the pasta and leave the veggies in the bow. But why don’t you like mushrooms? We love them — low-fat, versatile nutritious, easy to cook and (we think) delicious. Give them another try! This looks great, love all the fresh vegetables. Honestly I don’t think I can read your blog, I’d be hungry all the time! Just kidding, that looks delicious! You’re recipes all look SO GOOD! 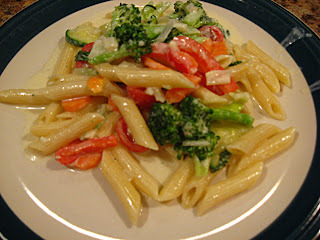 Umm that Pasta Primavera looks so good. I am a pasta nut.